One of the coolest museums in Gainesville! Definitely one of the best things to do in Gainesville. Shands Hospital is top ranked in both the State of Florida and the country. It's a level one trauma center and a leading organ transplant center. It's a Gainesville treasure ..
Gainesville is home to the University of Florida and this college-town is full of nature and culture. The city offers over 30 miles of biking and hiking trails and has seven area Florida State Parks close by. Floating down the spring-fed river at Ichetucknee Springs State Park is a can't miss Gainesville tradition. 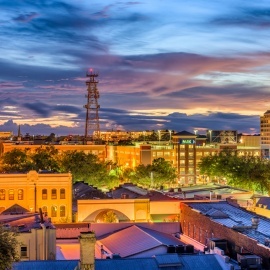 Downtown Gainesville is home to some of the best local home grown restaurants and window shopping. There is lots of college town fun, inexpensive things to do and a relaxed outdoor adventures. You'll also find local breweries and local plays and events at the Hippodrome State Theatre. Spring has finally sprung, and the hot summer sun is starting to show its face. There's no better way to escape the heat than with some of Gainesville's best ice cream! Five days before the football season opener, Florida Head Coach Dan Mullen announced his starting quarterback for 2018. Although Gainesville is smaller in comparison to other booming Florida cities, it's vastly spread out in terms of getting from one bustling area to the other.